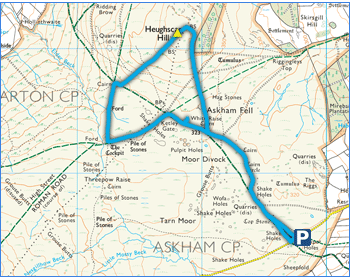 A short walk over Askham Fell and Moor Divock to visit many of the ancient remains visible on the fellside. The view south east from the parking area. The Cop Stone which is an ancient Bronze Age Standing Stone and Ring Cairn. An amazing view from the Cop Stone. One of the many Ring Cairns on Moor Divock. Another cairn which has largely disappeared in front of Heughscar Hill. A picture showing a stone alighnment between the Cop Stone and one of the Ring Cairns with two stones in the middle. Part of a Bronze Age stone row. White Raise Ring Cairn and open Cist burial. Many of the stones still standing. A panorama of the stone circle. Click for larger version. After following a section of the High Street Roman Road there is a new sign showing distances to the nearby forts. Up on Heughscar Hill are hidden Limestone Pavements. From this angle you can make out the burial mound on the summit of Heughscar Hill. A distant view of Helvellyn. Photos by Joe Jackson. Copyright 2006-2019. All rights reserved.